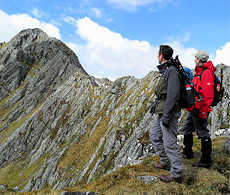 The South Glen Shiel ridge is one of the finest moutain ranges in Scotland. A varied range of peaks stretch for 13km in one continuous, well-defined chain. The drops between the peaks are not great and only once does the ridge fall below 800m. Contrasting to this, the bold outlines of the Forcan Ridge and Beinn Sgritheall shout loud as they rise dramatically from the valley floors at the western end of Glen Shiel. We're here for 3 days, hiking and rock-scrambling our way to the summits. 3 days of guided hiking and scrambling up high mountains in the Western Highlands. Enjoy superb, yet easy rock-scrambling up the Forcan Ridge. 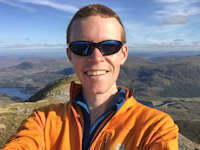 Bag up to 10 Munros over the weekend including The Saddle, Sgurr na Sgine, Aonach Air Chrith, Creag a'Mhaim and Beinn Sgritheall. 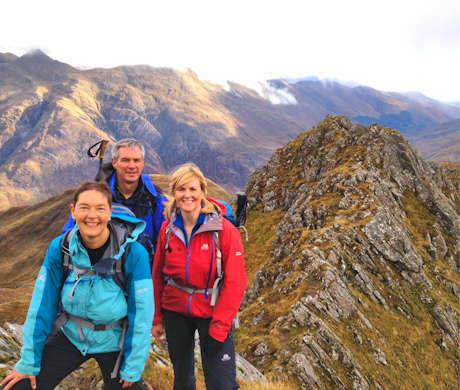 This 3 day event is a guided hiking weekend to high summits in the Kintail and Glen Shiel area with one of our experienced and qualified leaders. Your guide will know the remote area well and be able to give you insight into the flora, fauna and geology. Our maximum guide to client ratio on this event is 1:6 (1:4 on the Forcan Ridge day). The traverse of this ridge is one of the classic rock scrambles in the UK and ideal preparation for our guided events on the Aonach Eagach in Glencoe and the Skye Munros that run in May and September. Starting early morning from the roadside a few miles east of Shiel Bridge, we'll head uphill on a fine stalker's path towards the base of the Forcan Ridge. Most of the route is classed as a Grade 1 scramble. Airy in places, there's only one real difficulty on the ridge - the 'bad step', which can be easily by-passed. We'll reach The Saddle - the highest point on the mountain with stunning views westwards to Skye and northwards over Kintail to Torridon. After taking in the views, we'll enjoy an easy hike over to Sgurr na Sgine and descend back to the roadside via the steep and narrow nose of Faochag. 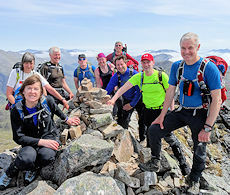 Fancy a day multi-Munro bagging, without a huge distance or ascent ? 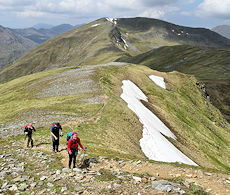 The South Glen Shiel ridge is one of the finest mountain ranges in Scotland with a varied range of peaks stretching for 13km in one continuous, well-defined chain. The drops between the peaks are not great and only once does the ridge fall below 800m. We start from the Cluanie Inn on a fine track heading for Creag a'Mhaim at the eastern end of the ridge. After some narrow ridge walking and a little scrambling, we're on a wide grassy plateau heading to Druim Shionnach. The ridge narrows again and we'll hike over Aonach air Chrith, Maol Chinn-dearg, Sgurr an Doire Lathain to Sgurr an Lochain in quick succession. Creag nan Damh is our seventh and final Munro of the day and we'll descend from its summit to the site of the Battle of Glen Shiel, where transport back to the Cluanie Inn awaits. 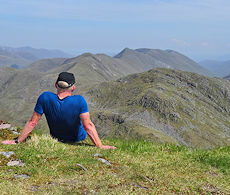 Solitary Munro in the Glen Elg peninsula with commanding views to Knoydart and Skye. A sea-level start and steep path lead to Beinn Sgritheall's summit, the solitary Munro in the Glen Elg peninsula. Meaning 'hill of the scree', Beinn Sgritheall lives up to its name ! We start our hike from Arnisdale, near the end of the public road that hugs the coastline from Glenelg. A worn path meanders around the crofts, then begins to steepen as it follows a line of fence-posts. As we get higher up, we'll hit the screes, fortunately faint paths can be be traced to the eastern summit of Beinn Sgritheall. Grassy terrain thereafter leads to the Munro summit from where there are terrific views in all directions due to the hill's isolated position. If we're feeling adventurous, we can return along the crest and head over the nearby Corbett peaks of Beinn na h-Eaglaise and Beinn nan Caorach (stats as above). Or, if you'd prefer a more relaxed final day, we can head downhill westwards for more views and through a lovely woodland to rejoin the roadside 1km from where we started (7km/1100m ascent). The routes have good stalkers paths lower down with generally grassy slopes leading to varied terrain higher up. The first two days hikes are classed as 'demanding' with the final day classed as 'moderate'. The Forcan Ridge has some rock-scrambling at Grade 1. Leading the event on 1-3 June'19. We'll be based in the Kintail area which has a reliable bus service running through from Glasgow, Fort Willam and Inverness to Skye (see the Citylink bus timetables for more info). Monday begins from Arnisdale which is around 18 miles from Shiel Bridge and there are no reliable public transport links along this route.